At Animas, we are passionate about coaching. We’re passionate about what coaching can do for individuals as they seek to make better choices in life, to become more resilient and to live more authentically. And we’re passionate about what coaching can do for organisations, helping leaders become more collaborative and team members to become more autonomous and empowered. Driven by this passion, Animas was established in 2008 and has quickly become one of the UK’s leading coach training schools, training over 500 coaches per year across London and Edinburgh. In 2018, we also opened our first international school in Berlin with plans for cities further afield. Graduates of Animas now coach in every area of life and work, including life coaching, executive coaching and the growing world of employed internal coaching. Our coaches work across education, corporate improvement and organisational development, parenting and youth, charity and third sector, creative fields and more. It is truly inspirational to see how our graduate coaches are using their news skills. It is psychological in that it is interested in what is happening inside the client as much as outside. It explores the client’s beliefs, values, expectations, assumptions and psychological patterns that guide how they show up in life or the workplace. It is humanistic in that it builds on the essential assumption that clients are whole and unbroken and that they have the resources they need to make improvements and that positive dialogue provides the space to realise this. 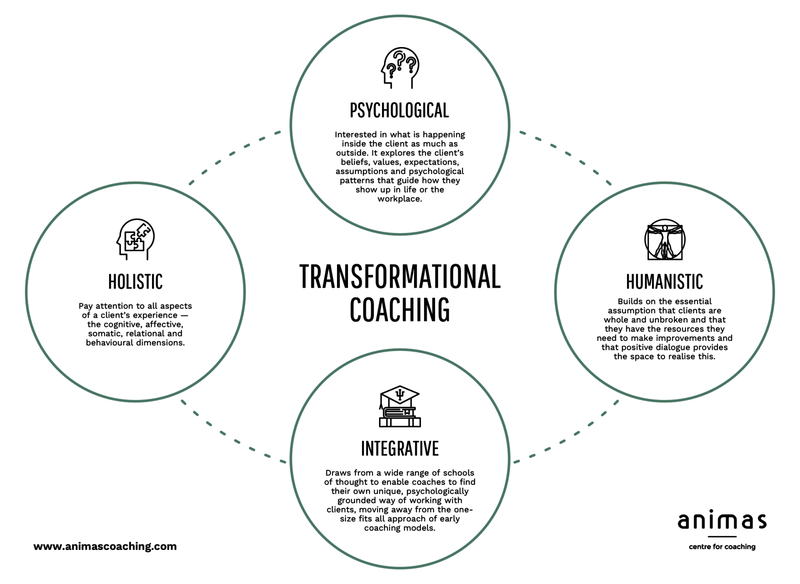 It is integrative in that we draw from a wide range of schools of thought to enable coaches to find their own unique, psychologically grounded way of working with clients, moving away from the one-size fits all approach of early coaching models. It is holistic in that we educate coaches to pay attention to all aspects of a client’s experience – the cognitive, affective, somatic, relational and behavioural dimensions. Animas has led the way in transformational coaching for many years and along with our core training, we support our coaches and the wider coaching community with a rich and progressive post-qualification educational programme that includes talks, workshops and even conferences. That’s because we know the coach’s journey is never over. It’s an ever-evolving story of growth, learning and application that enables an ongoing journey of mastery.